So they are eating up quite some bandwidth (~100GB in December). Let’s now dive into the new features one by one. 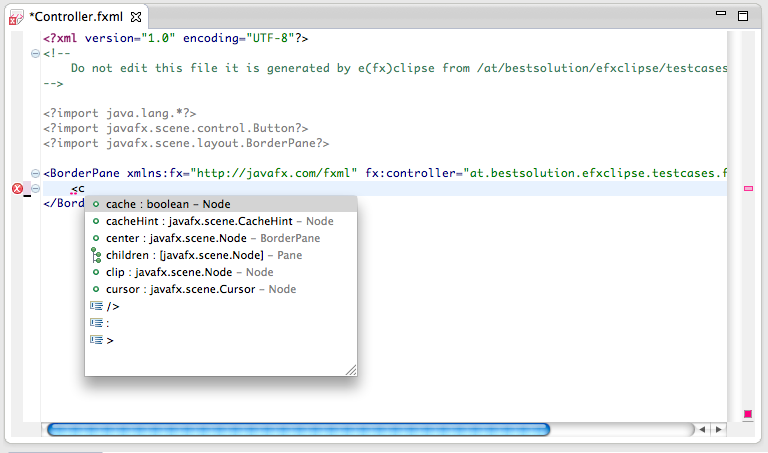 The aim of the all in one downloads has been to give developers an easy way to start writing JavaFX applications. 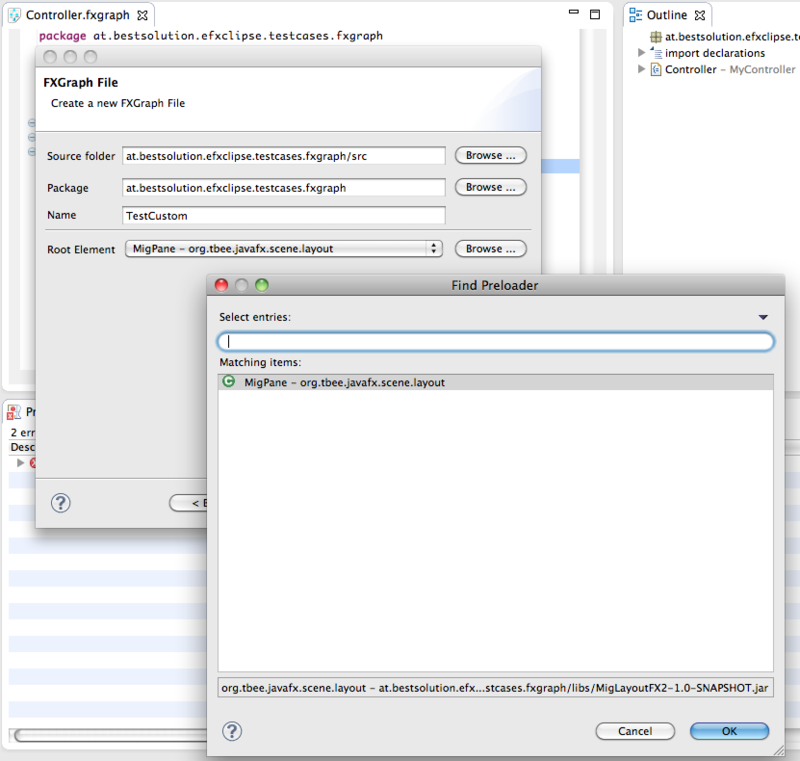 Now that JavaFX is provided as opensource in the openfx-project to give Eclipse users an easy way to contribute I added the mercurial-plugin 1.9.1 to the all in one downloads so that you can access the openjfx-repository without the need to install anything new. 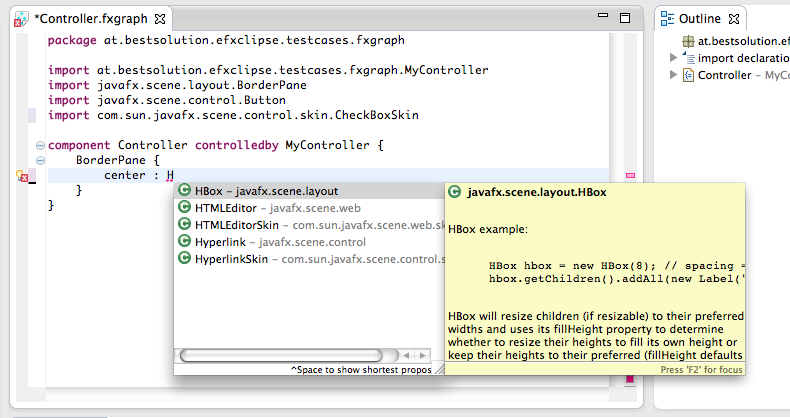 I also upgraded to Xtext 2.2.1 and EGit 1.2.0 so that you have the newest bugfixes in your IDE. There are 2 internal changes that happened which you might not directly notice. Until 0.0.9 the look of the JavaFX library for the Live-Preview was done on win32 by consulting the Windows registry and on Mac OS-X by looking for an ENV-Variable (JAVAFX_HOME). The approach had a draw back because it could have happened that the SDK you had configured in your IDE and the JavaFX version used for the live preview could have gone out of sync. 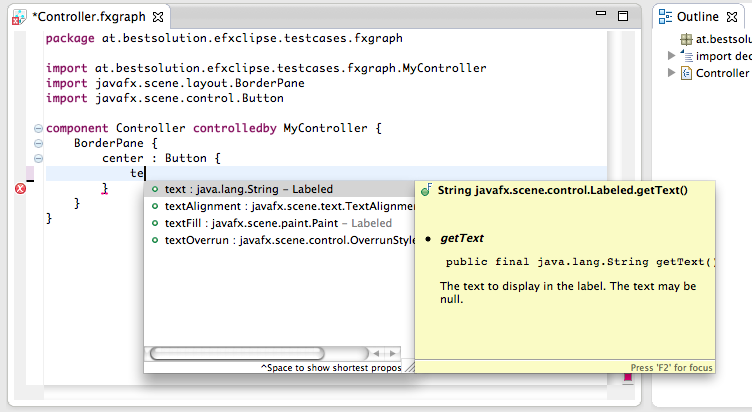 This has now changed and when running inside the IDE the configured SDK version is used instead. This makes it much easier for OS-X users because they now don’t have to reconfigure their ENV to use the live preview. FXGraph is my custom DSL used to author FXML-Files. I promised that I’ll provide a FXML to FXGraph roundtrip converted but I’ll have to defer this for 0.0.11 or even later. I’ve added support for factory-methods and to really support them I had to change the language a bit which is not a problem because noone could have used this feature because though the language had the keyword for it it was not implemented appropiately. 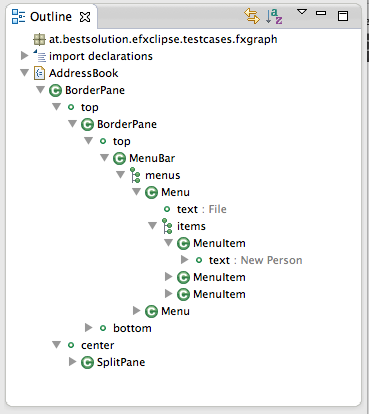 The outline view in 0.0.9 was the default one provided by Xtext. I’ve invested some time in 0.0.10 to customize it and show informations in a similar fashion the JDT-Outline view does. The content assist has been improved tremendously by limiting the results to values assignable to the left. The formatting like idents, spaces, line breaks, … have been customized so that you can now press CTRL+SHIFT+F like you are used to in Java-Files and the your source gets formatted nicely. 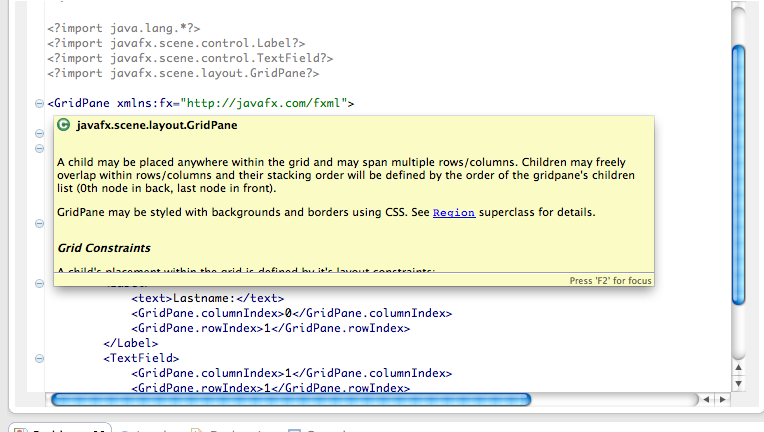 The JavaDoc is now shown everywhere like you are used to it in Java-Files as well. 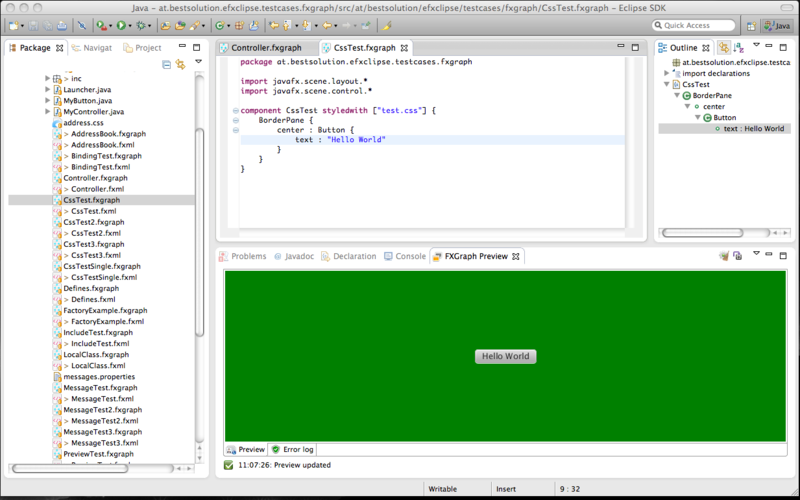 For example when showing the content assist for properties the JavaDoc is displayed next to the proposal. Attributes who are represented as enum-Values now provide a content proposal. The wizard has been improved to add support for custom root elements (and remembers them for the next time). So in 0.0.9 I switched the FXML-Editor from a custom written to an Xtext backed one (the only feature I had by then was to provide attribute proposals). So while I also added new features to FXGraph most of the time I spend in this release cycle was on the FXML-Editor front which now has decent sub-element proposals, JavaDoc support, … . The features are yet not as advanced as they are in fxgraph but they are coming along nicely. 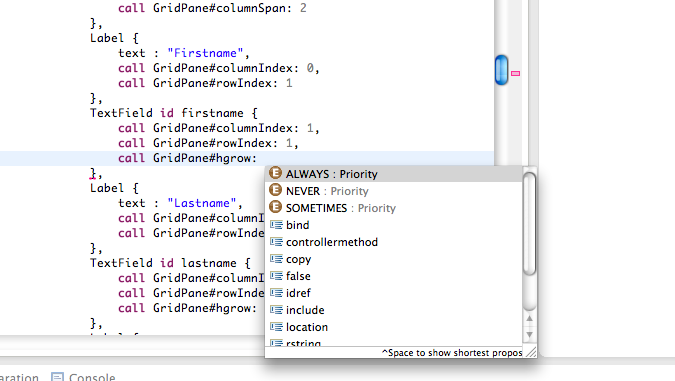 Not all elements yet show the JavaDoc appropriate for them but the most important ones already do. I think that this is the most interesting feature of the FXML-Tooling because it allows you see the resulting UI while you are authoring the FXML-File. I think the file is self-explanatory. 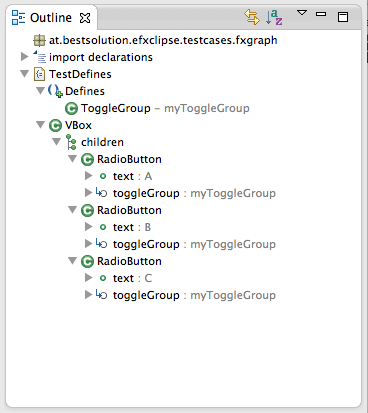 I have the following issue when upgrading from e(fx)clipse 0.0.9 to e(fx)clipse 0.0.10. in eclipse 3.7.1 with JEE tools standar. I do not use the preconfigured distro (eclipse 3.7.1 + e(fx)clipse + Xtext 2.2.1 + EGit 1.2.0 + Subclipse 1.6.18 + Mercurial 1.9.3). Yeah it was me, me, me 😦 My packaging script for 3.7.0 didn’t worked and so I didn’t discover version range problems I introduced. I just published the 0.11 repo which should to have this problem. Sorry for the trouble. Juan – did you manage to install with the 0.11 release? 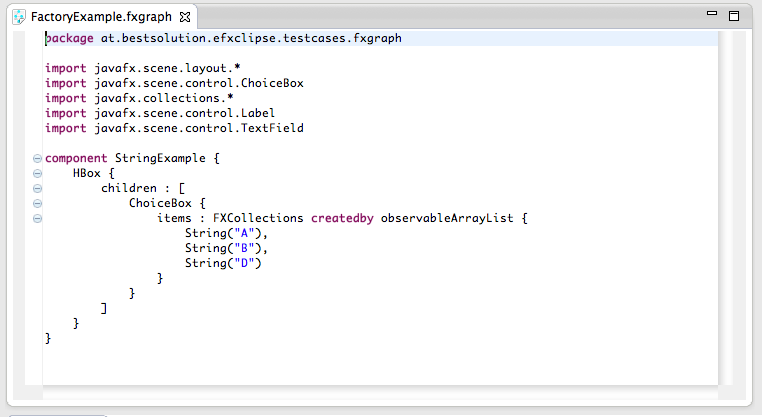 The update process for the 0.11 release of e(fx)clipse now works fine. Thanks, e(fx)clipse is a great job!